The Volaro application has its own official homepage at volarotech.com, but we would not be writing about this program if it were absolutely innocent. Despite the fact that at first glance Volaro looks like a decent application that can provide you with additional browser features, the reality is that the program is an adware application and it can seriously jeopardize your system’s security. Adware programs do not try to damage your system on purpose, but they can be used as malware distribution and online marketing tools, so you should not just let them be. Remove Volaro immediately and secure your PC against similar intruders. One thing that is specific about Volaro is that this application targets Middle East regions, and users seldom download it directly. All adware programs are subject to third-party distribution, and Volaro is no exception. However, rather than being distributed with freeware applications, this program usually comes with Trojans that are widespread in the Middle East region. Hence, although Volaro itself is not a computer infection, it usually arrives with serious security threats. Considering that Trojans are not too obvious about their presence, Volaro could be your first tell-tale sign that a dangerous infection has entered your system. Another unique feature attributed to Volaro is its variations. There are several different versions of this application, and while most of them simply display annoying commercial ads, some can even modify your default homepage to arabyonline.com. 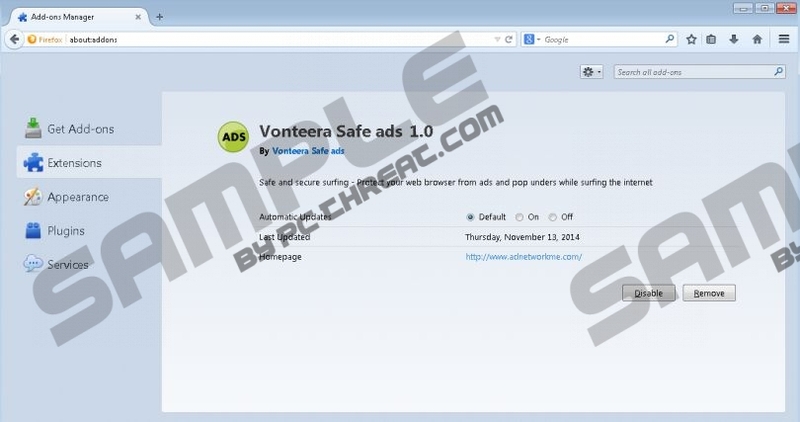 Most of the Volaro variations may also be known as Vonteera adware because they use the Vonteera platform to display commercial ads. Adware applications are rather ambiguous because they are not direct computer security threats. On the other hand, when it comes to Volaro, it is probably obvious that nothing good can come from this application, all the more so because it is related to Trojan infections. Volaro ads will not allow you to browse the Internet properly, and the program will slow your web browser. On top of that, the program can be easily used for malicious content distribution, so, if you see Volaro ads appear on your screen, you should never click on them. The program is not responsible for the third-party content, so it does not check what kinds of links get embedded into the ads. Removing Volaro is rather tricky. The program has an entry on the list of installed programs, but the uninstaller does not work. You need to access Program Files directory and delete Volaro and VonteeraAddon folders. Next, remove the Volaro extension from your browser (check out the instructions below). Eventually, scan your computer with the SpyHunter free scanner, because you need to make sure you have taken care of all the potential threats. Remove Volaro or Vonteera from Toolbars and Extensions. Disable and remove Volaro or Vonteera from Extensions. Remove Volaro or Vonteera from Extensions. Quick & tested solution for Volaro removal.